Things are buzzing right now with Asus tablets. 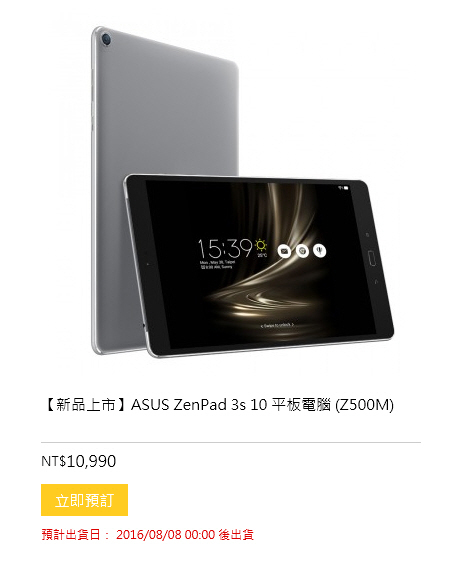 Right now the newly announced (and impressive) ZenPad 3S 10 (Z500M) is now up on the Asus Taiwan store at a price of NT $10,990 and shows a shipping date of August 8. Certainly a shipping date of a week from now is highly surprising to us. There are few images of this tablet on the internet and aside from one unveiling at a Zenfone 3 event, there has been little said about this tablet. So what about the ZenPad 3S 10 in other markets like the US? Hard to say right now. We are hoping for something in the Fall at the very least. We are confident that it will see a release outside of the Asian market, but the details right now are a bit of a mystery. Let’s look at the price though. At NT $10,990 it is $349 USD based on todays exchange rates. However we need to dig deeper. If in the US, this tablet will be cheaper. We’ve looked at the other ZenPad tablets and made some comparisons. The US prices can be anywhere from $20 to $40 cheaper! Thus, it’s entirely possible that the ZenPad 3S 10 could be just over $300 USD when it comes to market. For a flagship device with quality build and specs, that’s a great price. Things are moving forward at a pace faster than we expected. If we hear anything about other markets getting an early crack at the Z500M we will keep you posted. At the very least we expect these to be available on eBay from Taiwan based sellers. Stay tuned for those details! Any news when this is coming to US?? I’m waiting for a USA or European release. When and where can I buy the new ZenPad 3S 10 (Z500M)in Sydney Australia?